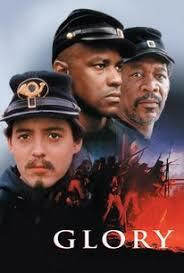 A compelling movie about the 54th Regiment, a group of black soldiers who fought in the Civil War. This is a wonderful movie about not just the Civil War, but a very specific situation during that war. Similar to how the movie Lincoln chronicled just one event in that man’s life, (the passing of an amendment,) Glory chronicles the story of the 54th regiment, a group of black soldiers who train to fight in the war. It’s the first time that black men were ever permitted to join the armed forces and serve not only their country, but their beliefs and interests. And what we get here is a story not only about them, but also about the men who work with them. The protagonist here is not one of the soldiers at all, but is Robert Shaw, (Matthew Broderick,) a man torn between his friendships and his duty. Shaw is the lead commander of the regiment, and he’s got a hell of an uphill battle, just to get these men to a place where they are able to fight. Between the uniforms, the weapons, and even the shoes, getting the men in his regiment the proper attire is always a conflict, and Robert handles them all without backing down. And while all of this is going on behind the scenes, at the camp sites, there is plenty of battle field action front and center to make this movie an overall compelling and well-rounded experience. Glory is a pretty incredible movie. It’s like the Saving Private Ryan of the Civil War, and by that I mean, this is the definitive movie of that war. It’s a movie that might be about a black regiment or group of black soldiers training and fighting, but it also chronicles the white people around them, and their situations. Two of the protagonists of this movie happen to be the white captains of the regiment, in command, but uncertain of how to run things. They spend the movie trying to figure out whether or not they are actually doing the right thing, being there and leading these men. And the black characters are loaded up with issues they are working through as well. The movie presents lots of conflicted characters and really gets to the heart of what these men were dealing with, both on and off the battlefields. This is an Edward Zwick movie and it’s from the time when Zwick was turning out his best work. Both this movie, and then Legends of the Fall, five years later, showed Zwick as an incredibly skilled director. Later on his career (about a decade after Legends,) he had one more strong movie with The Last Samurai, but has not fared nearly as well in the other projects he’s tackled. So what do his three successes have in common? War. Zwick captures the ins and outs of battle, (meaning the personal lives of his characters and what war does to them,) better than nearly any other director. And Glory is his masterpiece. This film is a classic, and for good reason. It was the breakout movie for Denzel Washington, who went on to win a best supporting actor Oscar. And Washington is but one of many actors here, who gives a knockout performance. Matthew Broderick is pretty wonderful in this movie too, as the head of the regiment, Colonel Robert Shaw, a man torn between his friendships to those under his command, and to his job of leading the company. He has two friends serving under him, Major Forbes (Cary Elwes) and Thomas (Andre Braugher.) Both of these men sign up because of Robert. They want to join their friend and serve under him. What they don’t realize is that Robert the commanding officer is very different from Robert the friend. Robert is perhaps the most conflicted character in the film. In fact, the start of the movie is about whether or not Robert will even take the position at all. We see him in a fight at the start of the film, where he goes into it way more confident than he should be, leading the men with his sword outstretched as if he is leading a parade. That’s when the enemy soldiers start firing and all hell breaks loose. Robert learns pretty quickly that this is for real and needs to be taken seriously. His confidence is shattered and he returns home to his family, only to find out that he is being hailed as a hero for serving in that battle (which turned out to be more like a massacre,) and surviving. Robert is now introduced to a number of important men, including Frederick Douglas, and he is offered the position of leading the 54th Regiment. It will be the first time black people have ever been permitted to bare arms and join the army. And much of this movie has to do with how these black soldiers are treated by the white soldiers or commanding officers around them. This is as much a movie about race as it is about anything else, with conflicts ranging from whether or not the black soldiers will be allowed to carry guns and wear the Union uniforms. And it’s Robert who must fight for the rights of the men under his command harder than anyone. 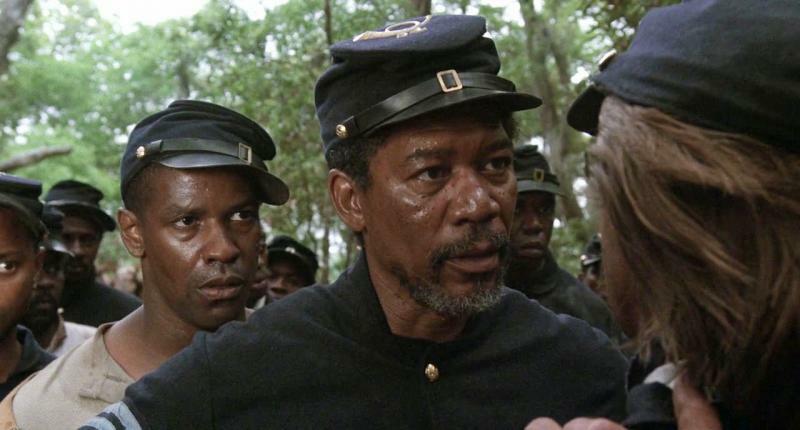 The soldiers who serve under him are played by a trio of famous black actors. Andre Braugher (of mostly TV fame, such as Homicide and Brooklyn 9-9) plays Robert’s childhood friend, but the two other soldiers who get major screen time just meet Robert for the first time when he takes command. These are Rawlins (Morgan Freeman,) and Trip, (Denzel Washington.) And the two of them couldn’t be more opposites. Trip is the angry young man who has been through and seen it all, and come out scarred to the point of no longer having compassion. Rawlins, on the other hand, is the older and wiser man who believes things will work out in the end, and is just happy to be there, getting the opportunity to fight for what he believes in. There are a number of instances where Trip finds himself ready to explode on someone, and Rawlins has to reel him back in and talk some sense into him. There are also times when Trip’s actions are misunderstood. The most front and center of these comes when Trip is caught running away from the camp and is labeled as a deserter. Robert must serve up the penalty for being a deserter, and it comes in the form of whip lashings. And Trip takes it without protest or complaint. He stands there, shirtless, getting whipped, and not making a sound. But a single tear does flow down his face, and its an incredibly powerful moment. Maybe that tear is for the pain he’s feeling, or maybe its because he’s being reminded, in that moment, of the whippings he used to get from his master when he was a slave. Strange and sad to be still receiving the same kind of punishment now. And it’s Rawlins who comes in and explains that the reason why Trip was away from camp in the first place was because he was out looking for a pair of shoes. Robert is tough with his men at all times, never wanting to show signs of weakness, but you can tell this is very much in contrast to who Robert really is. He’s not a tough and angry man, and in many cases he has to consider his options before making a rash decision. The case of Trip’s whipping is one of these situations. When Thomas tries to talk with him, friend to friend, Robert won’t have it and tells Thomas he needs to go through the proper chain of command before coming to him. But despite these tough gestures, when his men need something or aren’t being treated fairly, Robert is the first to speak up from them. And it’s this mentality that leads him to storm into the office of a superior officer and demand shoes for his men. With everything going on behind the scenes, in the camps and during training, it’s easy to forget at times that this is a battle movie. But then the movie brings the story right back around to remind us, by giving us another great battle. There are three in the film. The first battle is the one where Robert is serving as a soldier, and gets his confidence shaken up by the massacre. The second battle comes in the second half, when he is leading the regiment, and they come across and enemy force in the woods. And the third, and final battle comes at the end of the movie, with the characters having to storm a hill in order to take a base. This is the Saving Private Ryan-like battle, where you really get to see the different stages of the men getting closer and closer to their target.